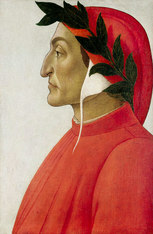 The Italian cultural society is named after Dante Alighieri, the famous poet from Florence who lived from 1265-1321. His epic La Divina Commedia (The Divine Comedy) is regarded as a landmark of world literature. Dante is recognised as the greatest poet of early Renaissance (il "Sommo Poeta" that means "the Supreme Poet") and was influential in the development and acceptance of Italian as a literary language. There are currently more than 500 Dante branches around the world with the number continuing to grow. Some 400 of them are outside of Italy and stretch across Europe, the America's, Africa, Asia, and Oceania. We are one of two Comitati (Committees) in New Zealand, the other being the Auckland Dante Alighieri Italian Society. Wellington has the Circolo Italiano which is affiliated to the Dante Society. ​The Comitato di Christchurch of Società Dante Alighieri was founded in 1960 by Bruno Ballara, helped by his sister Mrs Marusa Byatt and with the encouragement of Professor Douglas Kidd, head of the Classics Department of the University of Canterbury. ​Our members are of all ages, many of whom have had the Italian experience or are Italians now living in Christchurch. We meet each month from March to November. The mission of the Dante Society is to promote an appreciation of Italian achievements within the arts, literature, science and industry and to promote the study and preservation of the Italian language.